Memeo Connect may have just launched in January, but the Google Docs syncing and management application is already in line for a make-over. On Wednesday, Memeo unveiled a public beta of Memeo Connect 2.0, with GDrive integration and enhanced full-text search leading the parade of changes to the application. 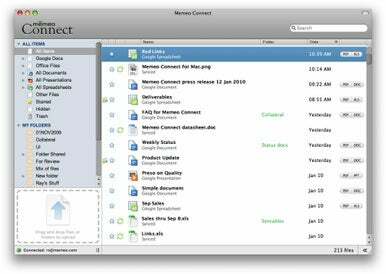 Introduced at the start of 2010, Memeo Connect lets users access their Google Docs files from any computer. The application continuously syncs with Google’s cloud-based office apps, so that users always have access to files and documents. Memeo targets small-to-midsize businesses as well as enterprises with its Connect offering. Memeo Connect 2.0’s GDrive feature lets you easily move documents and files onto Google Docs from your desktop. The 2.0 beta introduced Wednesday includes features tied into Google’s online storage capabilities. The GDrive support introduced in Memeo Connect 2.0 features a logical drive that’s integrated with the file system on your computer. Clicking on the GDrive icon on your desktop shows all of your files and folders, while dragging-and-dropping a file or folder onto GDrvie automatically syncs it with Google Docs. You can also use the Save As command in other applications—Microsoft Word, say—to save documents to Memeo Connect’s GDrive, which uploads them to Google’s cloud-based service. Another highlight to the Memeo Connect 2.0 beta is the application’s enhanced search capabilities. Users can now search by content as well as file name, with those searches occuring both locally and on files stored in Google Docs. The feature uses Google’s search engine, so results pop up speedily. The enhanced search tools should appeal to Memeo’s enterprise customers, particular those with voluminous files to search. GDrive and search enhancements may highlight the changes, but they’re not the only new features in Memeo Connect 2.0. Chen says there are more than 20 key additions and enhancements in the beta including an account status panel that shows you how much storage you’re using and better file management. Mac-specific improvements include the ability to categorize documents by whether they’ve been viewed, opened, or owned, as well as an auto-convert feature for turning files into the Google Docs format when you drag and drop them onto the cloud. The 2.0 beta will be available for both Mac and Windows users at the same time. Chen says that’s a necessity for Google Docs customers, who often have employees working on both platforms. 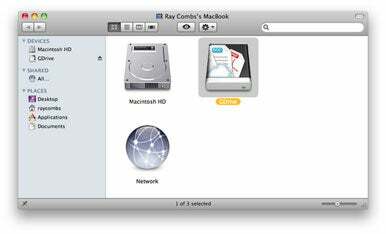 The Mac version of Memeo Connect requires Mac OS X 10.5.4 or later and a Google Apps Premiere Account. It costs $9 per account per year.